In your quest for migraine relief it is likely that you have discussed with your doctor various prescription methods of relief and perhaps, touched on non-prescription ones as well. Any prescription medication must be obtained with your doctor's approval and he or she may recommend other methods that you can access on your own. Non-prescription migraine relief generally falls into two categories: over-the-counter medications and 'alternative' therapies. Over-the-counter medications include painkillers such as aspirin and ibuprofen as well as various preparations for easing stomach discomfort that may occur alongside your migraine head pain. Alternative therapies are those such as herbs, nutritional supplements, massage, psychotherapy and physiotherapy. The side effects of any drug treatment, prescription or non-prescription, do tend to be potentially more severe. This is often simply due to the fact that most drugs are orally ingested and work directly in the body whereas many non-prescription alternative treatments work through emotional, mental or less direct physical means. Treatments such as counselling, biofeedback, acupuncture and massage often act more indirectly on triggers for migraine headaches. They work to promote relaxation and they also may focus on the entire body rather than one source of pain. The potency of prescription drugs versus non-prescription orally ingested herbs and supplements is often stronger but on the other hand, the pain relief can be more immediate and effective as well. Alternative treatments, however, are less likely to result in critical side effects but their immediate effectiveness is thus lower than prescription treatment. This isn't to say that alternative treatments can't do harm; it only means that they are, as a whole, less likely to do so. Certainly, various herbal treatments can have dangerous and even fatal side effects but again, this is more likely to occur with oral ingestion. Rebound headaches are also more likely to occur following regular use of prescription migraine treatments versus non-prescription drug or alternative ones. These can, however, still be minimized if you do carefully follow directions for use. Both prescription drugs and over-the-counter drugs must undergo rigorous testing through many phases prior to approval for migraine treatment. The effectiveness of alternative methods is one of the more confusing areas because one of the gold standards of studies-double blind placebo controlled- is difficult if not impossible to perform for some alternative methods. Migraines are not a mild headache and the pain experienced can be excruciating and extremely debilitating. When a migraine strikes, immediate relief is important and prescription strength drugs are more likely to provide intense speedy pain relief as opposed to alternative treatments. In the long run, however, alternative treatments can be quite effective for daily use to prevent migraines. There is a stigma associated with both prescription and non-prescription methods of migraine pain relief. The traditional medical community are not always receptive to alternative methods of treatment and one reason for this particular attitude is that many alternative treatments rely on anecdotal evidence. It isn't to say that they can't work but only that they have not received the same standard of aggressive testing that drug treatments obtain. Since the likelihood of serious side effects is overall lower with non-prescription treatments when followed as directed, the lack of solid evidence may not be a deterrent from trying out a new treatment. There is also a stigma within the 'natural' health treatment community with regards to prescription treatment. People who choose to take prescription medication are seen as taking an 'easy' way out and are not viewed as active participants in their healthcare. It's unfortunate that the two communities are often pitted against one another rather than reaching a symbiotic relationship, where prescription and non-prescription alternative treatments work together in a complementary manner. Effort: Is Swallowing a Pill Easier? Many alternative treatments require a great deal of effort on the part of the individual. Treatments such as biofeedback, imagery and deep breathing require a focus and willingness to address less tangible problems, such as emotional and mental anxiety. Your migraine treatment plan should be one that fits comfortably into your daily schedule. Taking a prescription pill may indeed be an easier and effective way to prevent and treat migraines without upsetting your daily routine. Many of us are trying to balance work, home and personal life alongside headache pain, and it can be very challenging and difficult to incorporate the often time consuming dedication required to maximize the benefits of alternative treatment. 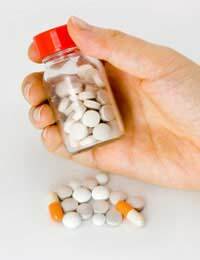 You should not feel guilty for wanting the convenience of a prescription drug but you should be cautious with reference to side effects, because any unpleasant side effects may then require more effort and time to address. Your doctor is and should remain the primary point of guidance for migraine treatment but other practitioners, such as a herbalist, acupuncturist, naturopathic doctor or massage therapist may complement your prescription drugs. Some individuals, particularly those who have identified stress as a main trigger for migraines, may be able to rely on non-prescription treatments to prevent migraines, and will use prescription medication only to treat a migraine when it occurs. Ultimately, the best treatment plan may not involve choosing prescription over non-prescription treatments, or vice versa. It will more likely be a combination of both drug and alternative pain relief methods that offer treatment. Hopefully, whatever methods you and your doctor choose will allow you to get back to the joy of daily life without migraine pain.